You may recall my post The trajectory of property spruiker Dean Letfus which was the blog equivalent of a sharp intake of breath at the positioning of Dean Letfus‘s smiling face on the cover of the NZ Property Investor magazine. There are many indicators pointing to an improving property market. The economy is doing well, affordability is back to levels last seen 10 years ago, Interest rates are predicted to stay low for longer, demand is increasing yet new building consents are still quite low. Auckland and Christchurch may be leading the property recovery, but other areas will no doubt follow as their local economies improve. Many PIA [Property Investor Association] members I have spoken to over the last two years have been selectively buying rental property in anticipation of this improvement. It is apparent that new or aspirational investors’ are not in the market yet, however it is only a matter of time. As the market improves there will be an increasing need for good information so that new investors make informed decisions and fewer mistakes. No doubt there will be an influx of commercial enterprises to fulfil this need for information. Some will be good and some will be worse than a waste of time, they will be dangerous. The lead article in the NZ Property Magazine last month was an excellent warning to investors looking to find help with their investment strategies. After attending a Richmastery course on investment property and buying 13 properties in seven months, Dean Letfus said that he realised he was “different”. He certainly was. With scant information and no real knowledge, he called himself a property professional and educator. Using his belief in god to gain people’s trust, he established himself as a property mentor and charged large fees to share his self-prescribed professionalism. Unfortunately Dean mistook reckless risk taking and naive strategic knowledge as professionalism and expertise. During an incredible period of increases in property prices, Dean not only didn’t manage to improve his financial situation, unfortunately for him he went bankrupt. Dean said that his strategy would have been fine as long as the market never stopped. This is the key point that illustrates why people like Dean should never be property educators. Most involved in the property investment industry know that property moves in cycles. This is basic. The downturn in the property market was well anticipated and actually went on for longer than most analysts expected. That this was not allowed for in Dean’s strategy clearly shows that he was not the expert he claimed to be. No doubt some of Dean’s clients would have done well, seeing through his strategy faults and perhaps not being the risk-taker that Dean appears to be. But did they need to pay Dean a large amount of money to achieve this success? Probably not. The information is already out there in other more cost effective forms. 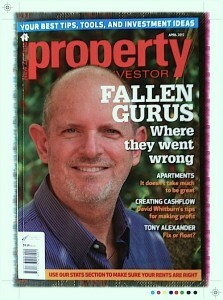 There are a variety of New Zealand based books on property investment. There are regular articles in this magazine and of course there is access to Property Investor Associations all through New Zealand, where members get access to excellent meetings, seminars and exposure to a variety of property experts. If you are looking for information on investment property or know someone else who is, remember that there are many who are salespeople rather than property experts and educators. Check them out carefully before handing over your hard earned money. In many cases it would be better spent as the deposit on a rental property.